The greedy officials of the village of Brodny learn to their horror that the Emperor’s representative, the Inspector General, is coming on a tour of the Empire to check that every part of the empire is upholding its law and creed, and sweeping out corruption wherever it may be. While they conspire to do anything they can to avoid losing their power and wealth, the travelling show selling Yakov’s Golden Elixir (furniture polish sold as miracle tonic) breaks up after Georgi’s honesty gets a mob set on them. Jobless and penniless, Georgi wanders into Brodny starving and soon gets thrown in jail. Until the town officials realize that this unknown vagrant could be the Inspector General in disguise, a role he finds himself stuck in when Yakov catches up with him and talks him into taking bribes from the officials in the belief that Yakov will use them to help the exploited townsfolk. The “bungled assassinations” were exaggerated. There was only one actual attempt, and one scene where Georgi came close to drinking poison that actually wasn’t an attempted assassination (too involved and funny to get into here). Meanwhile, there’s lip service paid to doing good for the town, but the only specific thing anybody seems to have in mind is buying back a church organ the officials had collected for and then sold but claimed destroyed, which is mostly going to help them in morale. I was a little disoriented by the setting of the story. From the names, clothes, and architecture, I was content to believe it was still 1800s Russia, but one of the reasons Georgi is believed to be the Inspector is because he’s carrying a fake letter from Yakov’s show that claims to be from Napoleon, and there’s a line that suggests that the capital of the empire is Budapest. So I get the sense this is just kind of an east-central European soup. 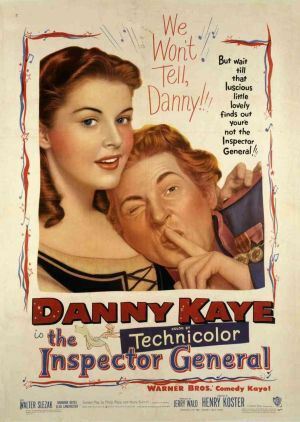 I was thinking that Danny Kaye is mainly remembered as a singer, but I think I got him crossed with Dennis Day. I was quite impressed and entertained by his comic acting, and particularly the great deal of physical comedy. He gets a few good songs in, but he’s also not afraid to sing poorly for a laugh. I don’t really have much to say about anybody else except that Yakov is an effectively-portrayed bully who doesn’t deserve what he gets in the end. My understanding of the source is muddied by time and abridgment, but I think hardly anything of the original past the basic concept survives, mostly from the attempt to tell the story with a likable protagonist. The result is a charming, but lukewarm film that trades biting satire for more easily accessible fun. Previous Article Rock, Rock, Rock!